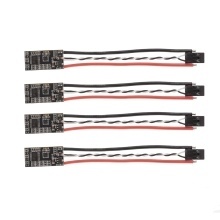 The market&apos;s lightest and smallest ESC, designed specifically for high-level FPV racing. High voltage design suitable for 3-6s batteries. New heat sink design both effectively reduces the core temperature, and avoids propeller strike damage. 3oz High-TG PCB board, significantly reduces electrical heat soak and improves system efficiency. Bright RGB LED indicates status and custom color(Programmable via BLHELI Suite).